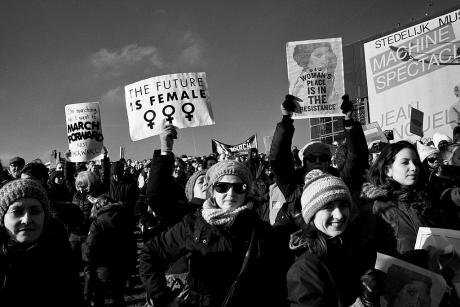 Protestors hold up their signs at the Women's March on Amsterdam in January 2017. Credit: Guido van Nispen/Flickr [CC BY 2.0]. Some rights reserved. In the UK, the revolution started with a hand on the knee. Harassment and assault allegations rocked the British Parliament. Minister after minister was forced to resign. They apologised for behaviour that ‘fell short’ of the rigours of high office. But angry constituents demanded to know why their behaviour still entitled them to the job of MP at all. 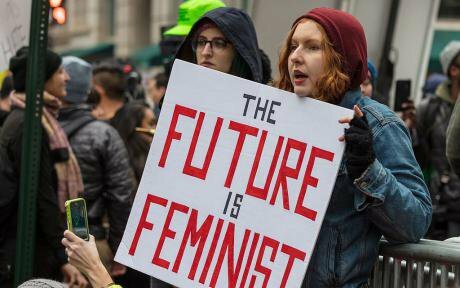 A protestor holds a poster at the Women's March in Georgetown in January 2017. Credit: James McNellis/Flickr [CC BY 2.0]. Some rights reserved.Before the end of patriarchy, it was said that governments needed 30% female representatives for our issues to be taken seriously. Now that the standard is 50%, or more, women’s concerns are no longer seen as a side issue or niche interest. Women’s rights are accepted as human rights.